A Facebook executive in Brazil has been detained after authorities said the company failed to comply with a court order. The court order asked Facebook to provide data from WhatsApp, a messaging app it owns, in connection with a criminal investigation into drug trafficking. 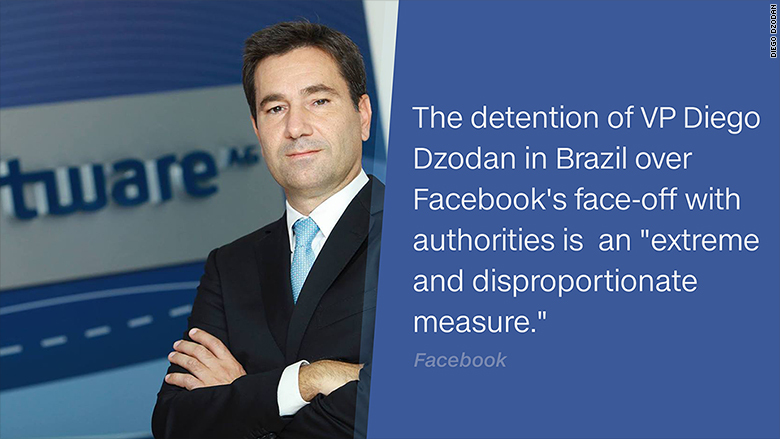 Police in São Paulo took Diego Dzodan, Facebook's VP for Latin America, in for questioning on Tuesday morning. He is still in custody, Facebook said. Dzodan joined the company last June, according to his LinkedIn profile. His Facebook and LinkedIn profiles also list him as the VP for Latin America at Instagram, which is also owned by Facebook (FB). Dzodan's detainment comes four months after authorities first obtained a court order, according to a spokeswoman for Brazilian Federal Police in the state of Sergipe. Authorities in Sergipe said they needed Facebook's help in a case where the suspects used Facebook Messenger and WhatsApp to communicate and plan their crimes. Gmail was another platform, according to the spokeswoman. According to the authorities, the judge issued the order three times and started fining Facebook 50,000 reals ($12,600) daily for noncompliance two months ago. Last month, the fine increased to 1 million reals ($253,000) per day. A warrant was issued for Dzodan on February 7. In an emailed statement to CNN, a Facebook spokesperson called the detention an "extreme and disproportionate measure." "We're disappointed," the company said. "Facebook has always been and will be available to address any questions Brazilian authorities may have." Facebook bought WhatsApp for $19 billion two years ago. The two companies are run independently, according to Facebook. There is only one Facebook office -- a sales office -- in São Paulo. It's unclear if anyone in that office has the ability to make product- or policy-level decisions for Facebook or any of the companies that it owns. This is the second time in the past few months that WhatsApp has come under scrutiny by the judicial system in Brazil. Late last year, a judge ordered cell phone operators to block the messaging app for 48 hours as part of a "in a criminal investigation." While the two criminal cases are unrelated, both situations illustrate the growing struggle between tech companies and law enforcement around the world. Because WhatsApp encrypts information that passes through its platform and does not keep that information on a central server, it's harder for it to hand over data requested by authorities. In the case in Brazil, WhatsApp says it's impossible to give data because of the strength of its encryption, and because the data is kept only on a person's device after it is delivered. "We are disappointed that law enforcement took this extreme step," a WhatsApp spokesman said. "WhatsApp cannot provide information we do not have. We cooperated to the full extent of our ability in this case and while we respect the important job of law enforcement, we strongly disagree with its decision." The Brazilian government made more than 3,700 requests to Facebook for user data in the 18 months that ended last June, according to Facebook records. That includes data from all Facebook services, including Messenger, WhatsApp and Instagram. The company provided "at least some data" in about 37% of those requests. "The vast majority of these requests relate to criminal cases, such as robberies or kidnappings," Facebook said. "In many of these cases, the government is requesting basic subscriber information, such as name and length of service. Requests may also ask for IP address logs or account content." Faceook says it has "strict processes" to handle government demands. The company checks each request for "legal sufficiency," and all officials must give a detailed description of the legal and factual basis for their inquiries. "We push back when we find legal deficiencies or overly broad or vague demands for information," according to Facebook. "We frequently share only basic subscriber information." -- CNN's Alessandra Castelli, Chris Liakos and Shasta Darlington contributed to this report.